The lighting of the cauldron at the 1992 Barcelona Olympics. The Olympics live on symbols. The five colored rings that represent the five continents of the world. The doves that represent peace. The gold, silver and bronze medals that symbol achievement at the highest sporting levels. One of the most dramatic symbols of the Olympic Games has been the lighting of the Olympic cauldron that symbolically represents the Games ancient Greek origins, the beginning of the Games, and by extension, the suspension of hostilities in times of conflict and the coming together of the world’s athletes in competition and fair play. The cauldron lighting of the 1964 Tokyo Olympics most poignantly emphasized the need for world peace. While this particular ceremony started at the 1936 Berlin Olympics, it was at the 1992 Barcelona Games where organizers raised the bar significantly in creating the Wow factor, that moment when you’ve seen something spectacular, something you would not have imagined or expected. In this case, it was paralympian archer, Antonio Rebollo, who shot a flaming arrow some 60 meters over a cauldron that rose seven-stories high, igniting the gases accumulating over the cauldron, and sending chills and thrills across the world. In 1996, the organizers of the Atlanta Olympics had all sorts of issues with the planning of the cauldron lighting, but one thing they got right was having Muhammad Ali do the honors. Spectacle had to wait four more years for Sydney to bring goosebumps tot the world. An island nation, surrounded by water, Australia brought fire and water together in spectacular fashion. 400-meter sprinter, Cathy Freeman, stood in a pool of water. 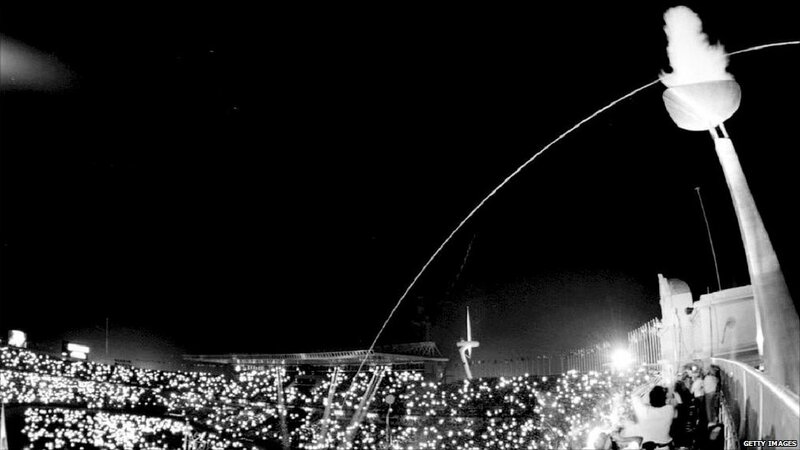 When she placed it to the watery surface, a ring of fire curled around her, the cauldron rising out of the water like a spaceship, making its way majestically to its home at the top of the stadium. In 2008, China amazed the world with its spectacular opening ceremonies, highlighted by its impossible-to-imagine sky run, performed by legendary gymnast, Li Ning. Rising high above the crowd, suspended on wires, Ning appeared to run along the stadium wall for 500 meters before applying his torch and igniting another flame that spiraled up into a spectacular ignition of the cauldron. What new spectacle and symbolism will the Rio Olympics bring? Our hearts are already a-flutter in anticipation. Posted in Other Olympics, Pop Culture, Rio Olympics, Technology, Tokyo 1964 and tagged 1936 Berlin Olympics, 1992 Barcelona Olympics, 1996 Atlanta Olympics, 2000 Sydney Olympics, 2008 Beijin Olympics, Antonio Robollo, arrow, Cathy Freeman, cauldron lighting, Li Ning, Muhammad Ali, torch lighting. Bookmark the permalink.